Like many good ideas, it was one simple comment that got me hooked. A while back, a friend made a comment about a casual book to art project – we wold choose our own books, and our own project. The only criteria was we needed to have it done and posted by October 31. In the way my mind tends to go with these things, I felt this was as good an excuse as any to try something new, so a bit of research, some window shopping, followed by some back & forth before biting the bullet & ordering supplies, and I was all excited to get going. We hit a bit of a timing snafu, as well as a couple of minor (but I am assured correctable) equipment issues, and I decided that as we were already setting dates for our next round, I needed to bite the bullet and shift to my backup project. (And no, I am not telling you the original project or book as I hope to use it next round). 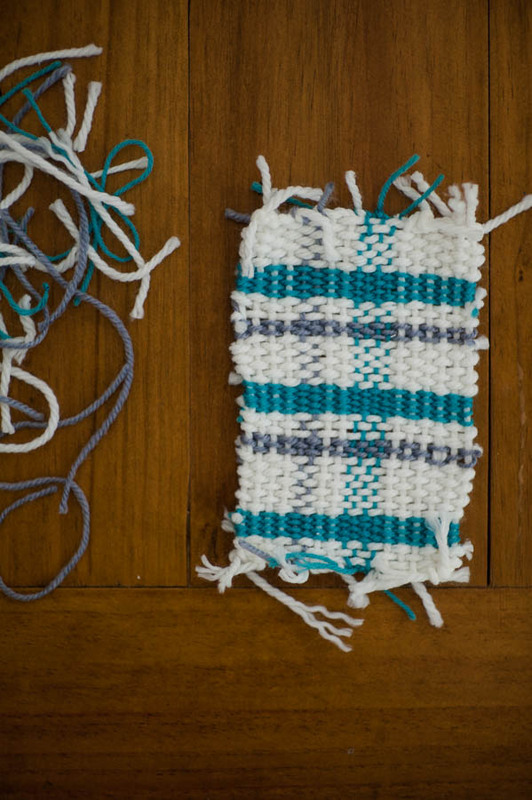 For a while now, I’ve been seeing little DIY weavings pop up. My interest in weaving was first piqued by Esther & her loom purchase & subsequent pinning spree, but a full sized loom was never going to be an option for me. A few months back, when Sam’s Warehouse went belly-up, and our local was having a clearance sale, I grabbed a few balls of yarn that were an absolute bargain at $1, and a cheap photo frame to use as a base for my loom. It has since sat in my yarn shelves, waiting for me to have the time to get stuck in and play. Once this project came up, I thought it might be the perfect opportunity to have a go. Originally, I had planned a more modern style weaving, but the idea of a tartan, inspired my recent reading of Outlander books 1 & 2, came to mind and I just couldn’t shake it. So on Saturday I gathered my supplies, added some nailed to top & bottom of the frame (spaced at 1/2″) and got busy. By Saturday night, I was done.